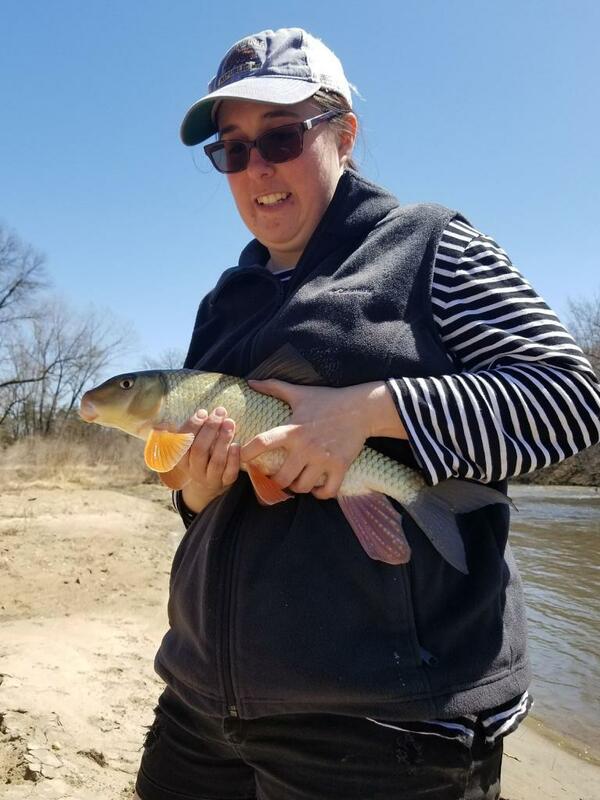 Home » Spring is Here...And so is a new Roughfisherwoman! 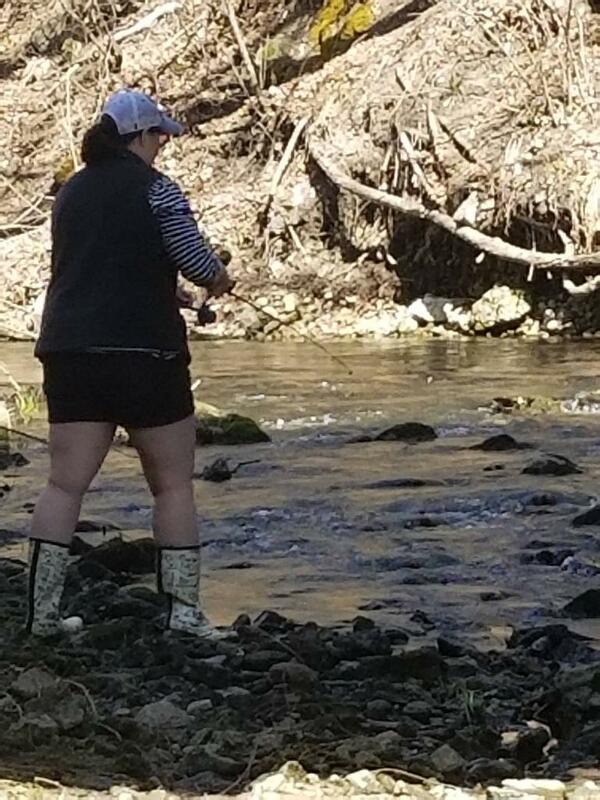 Spring is Here...And so is a new Roughfisherwoman! Early 2018 was an amazing time for me. Well, except for one thing: WINTER NEVER ENDED. 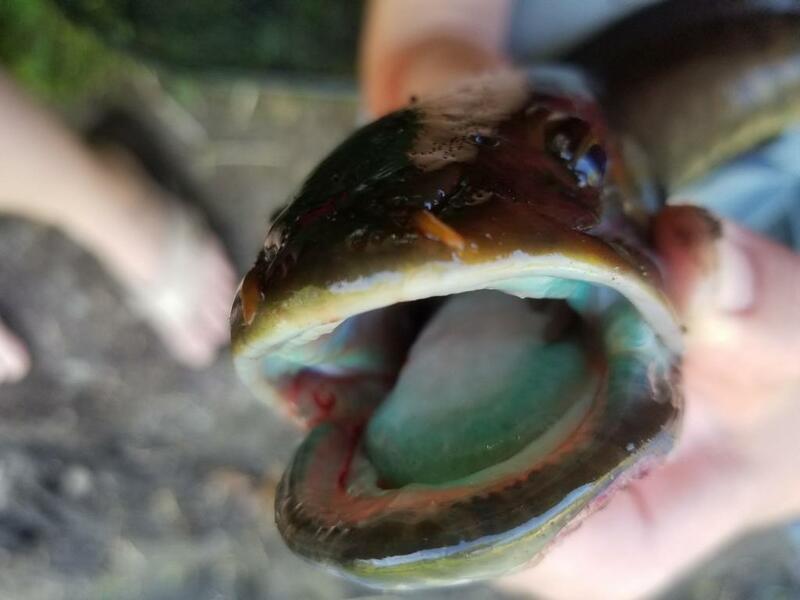 When it finally did, though, 5 months of pent-up fishing aggression was released in a cathartic frenzy. Oh, also, I started dating an amazing woman who was open to the idea of roughfishing. That too. 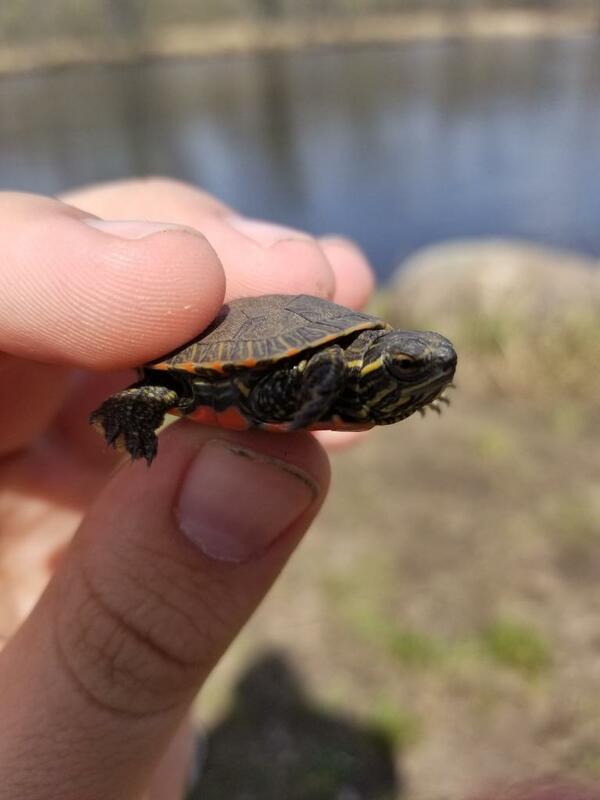 Winter did not let go of us until mid-April this year; my first outing in over 6 months happened as soon as ice was off of the major rivers and temperatures were solidly above freezing. 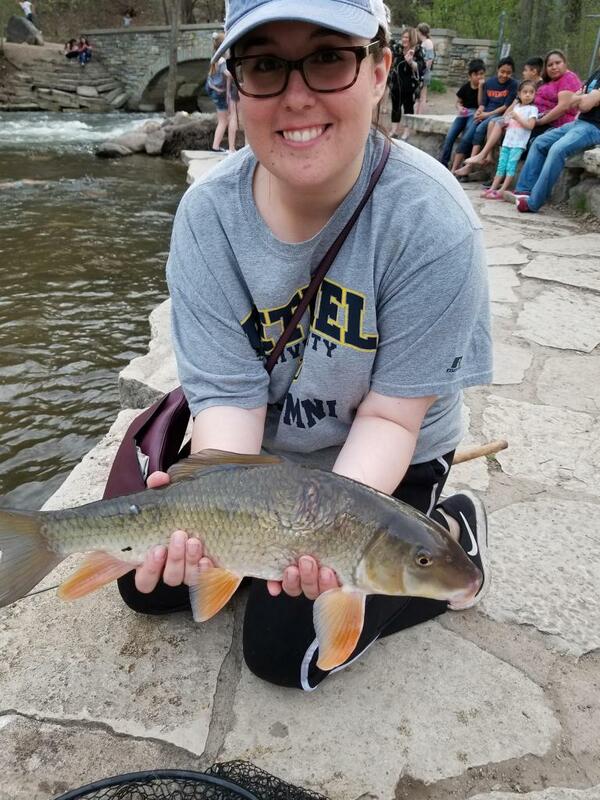 E-Kol told me he was going out to a well-known redhorsing spot on Sunday, and I took Dani on her first-ever real fishing outing. 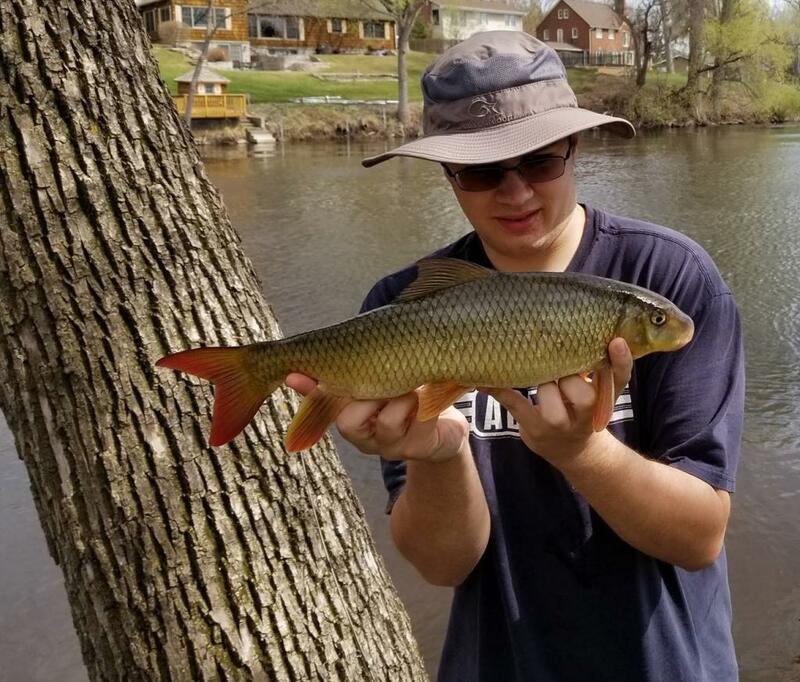 Unfortunately, water was high, muddy, and cold because of snowmelt, but Eric managed a few small redhorse, and I got my first of the year - a small golden redhorse. Dani was an eager learner, demanding that I teach her how to tie the Carolina rig and how to cast; she is a natural at both. 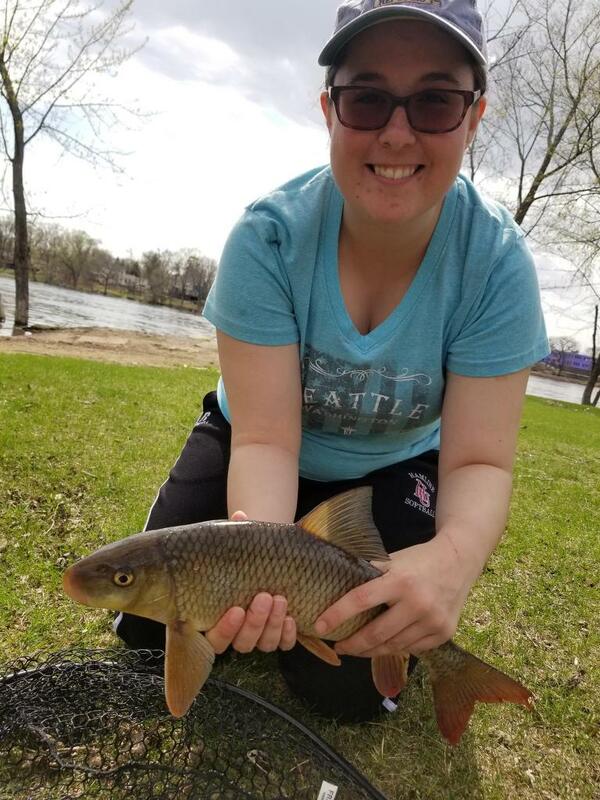 I was hoping that the first fish of her life would be a redhorse (that way, she wouldn't have a choice but to be a roughfish person for life! 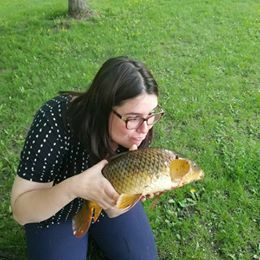 ), but despite some convincing bites, she was unable to hook up with one. 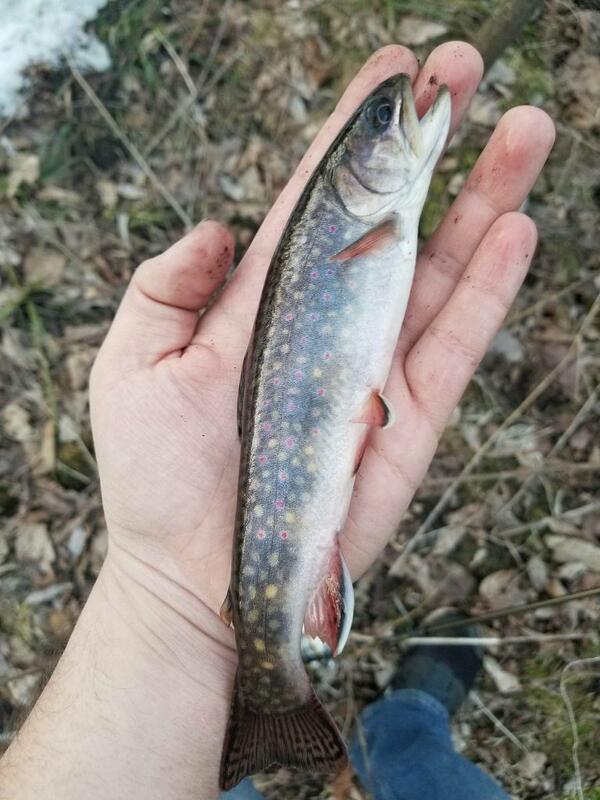 Not to be deterred, I took her to a spot I knew to hold large numbers of brook trout year-round. 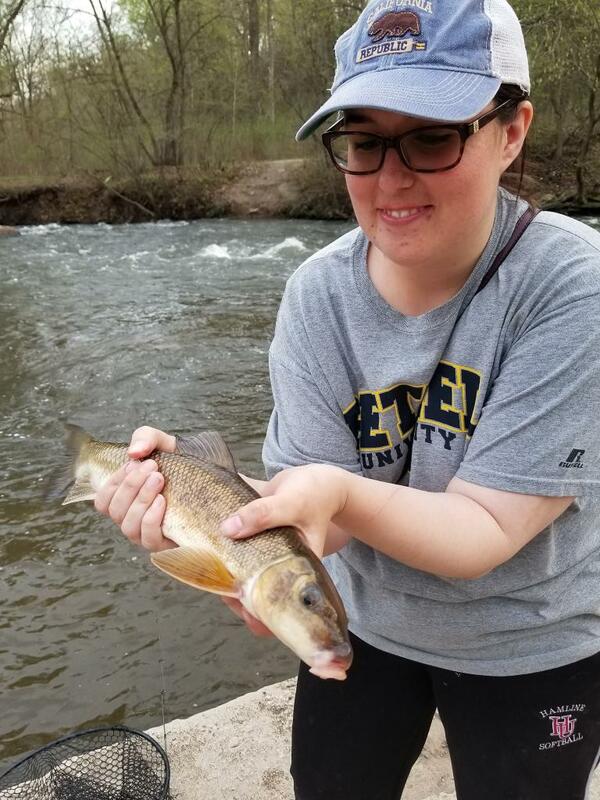 After showing her a few fishy-looking spots in the creek and unsuccessfully fishing the one I had in mind, she pointed out a particularly good stretch of water and insisted that we fish there while we still had daylight. 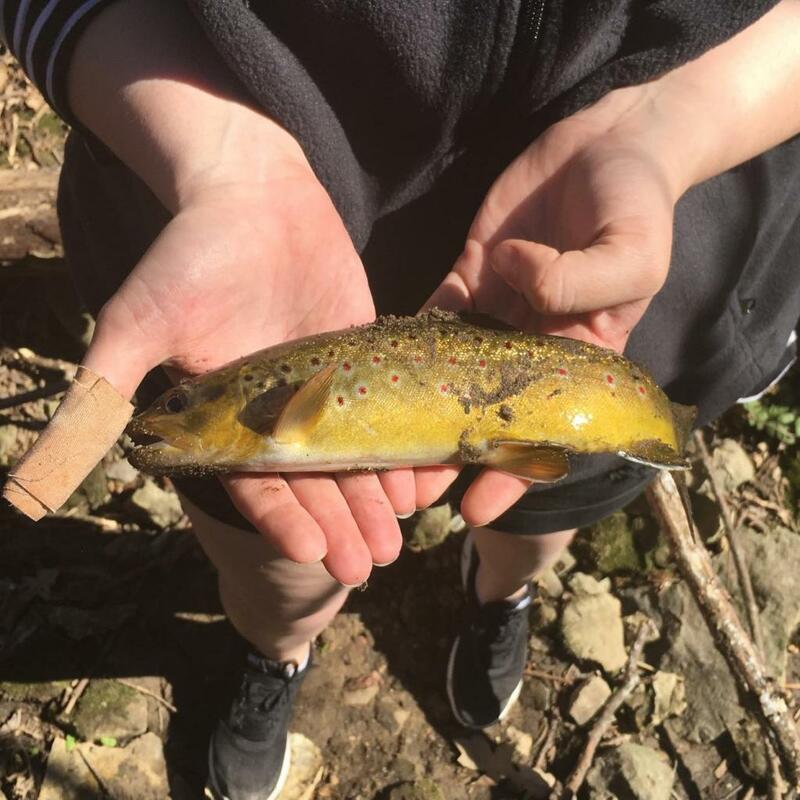 While demonstrating how to drift for trout, I hooked and landed one on my first cast - she was NOT amused! 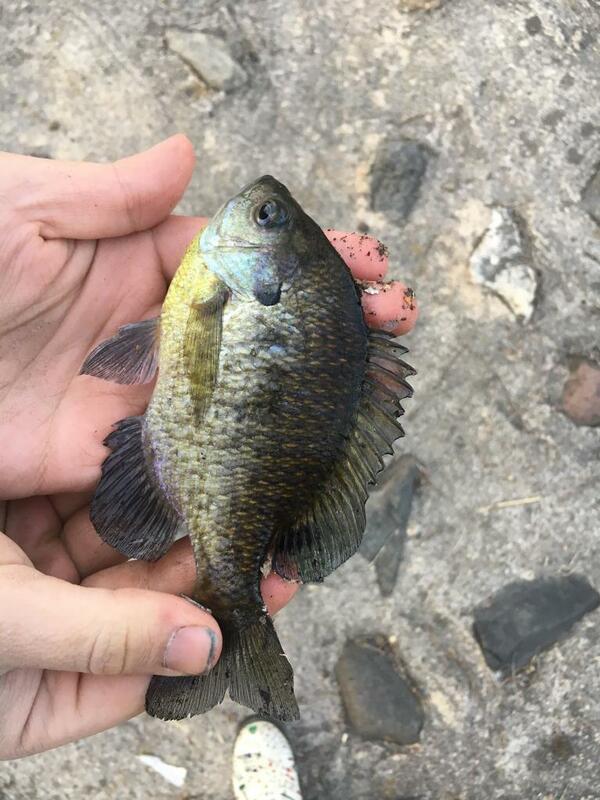 Before long, she had one of her own, but it slipped out of my hands before I could get a picture of it for her (I'm still counting it as her first-ever fish, since it was on the bank and it was my own idiocy that caused it to slip away). 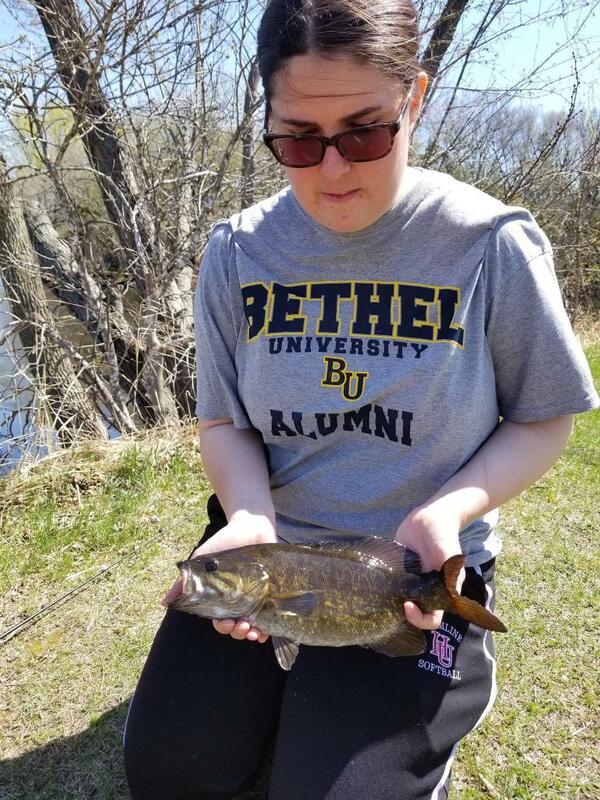 Regardless, it was really cool to introduce her to fishing and get her a fish - not many people can say that the first fish they landed was a brook trout! 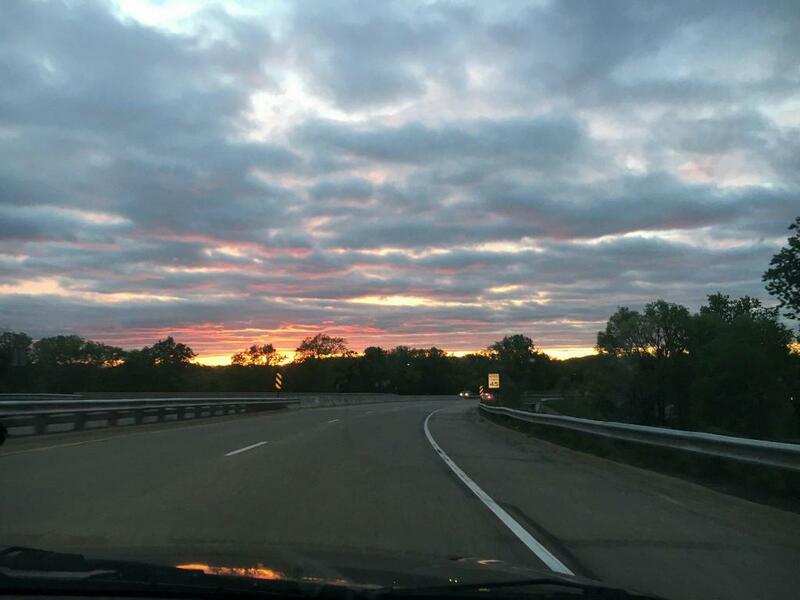 The following weekend was supposed to be gorgeous, with temperatures in the mid-70s and few clouds. 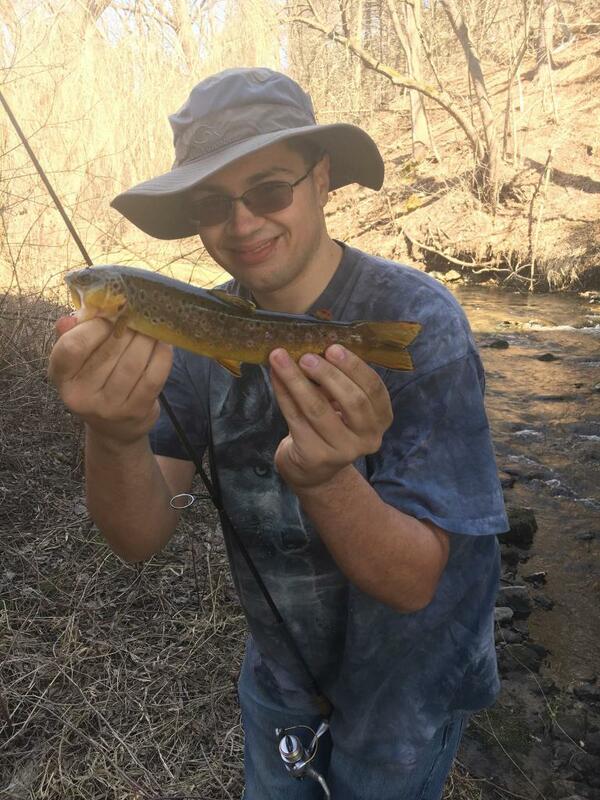 With the metro rivers still high and muddy, I decided we would take a trip down South to fish one of my favorite river systems and make a stop at a neat creek along the way. 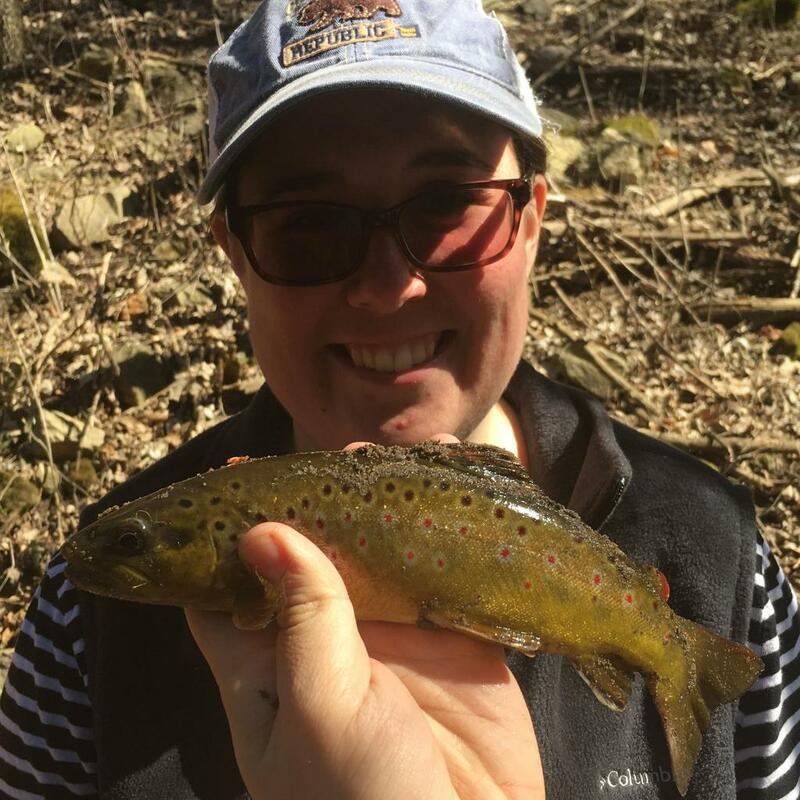 It didn't take long at the creek for Dani to catch her lifer Brown Trout. 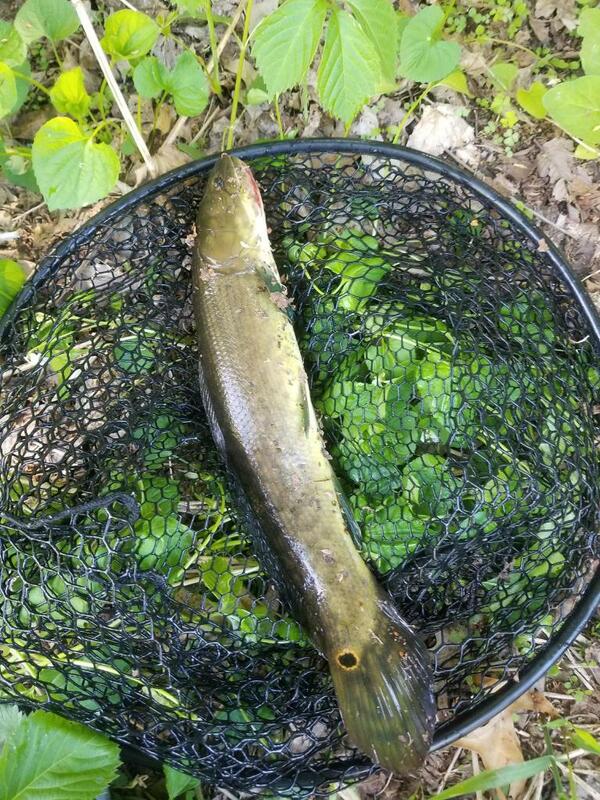 Believe it or not, that's a big fish for that creek. With a few fish under our belts, we decided to leave for our final destination of the day. We arrived and walked a short ways down the beach, and I tossed out. 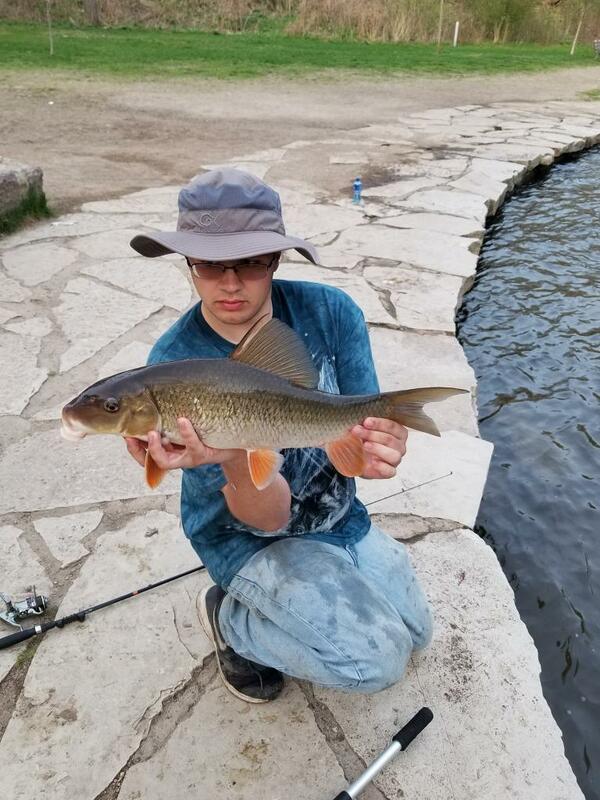 Within 2 minutes (before we had time to even finish setting our things down and get our pizza out), I hooked up with and landed a solid Silver Redhorse. Thinking it might have been a fluke, I cast again on the edge of the current seam, and turned back to my pizza. When this one came to hand, I gave up on the idea of eating and focused on getting Dani on her first rough fish. 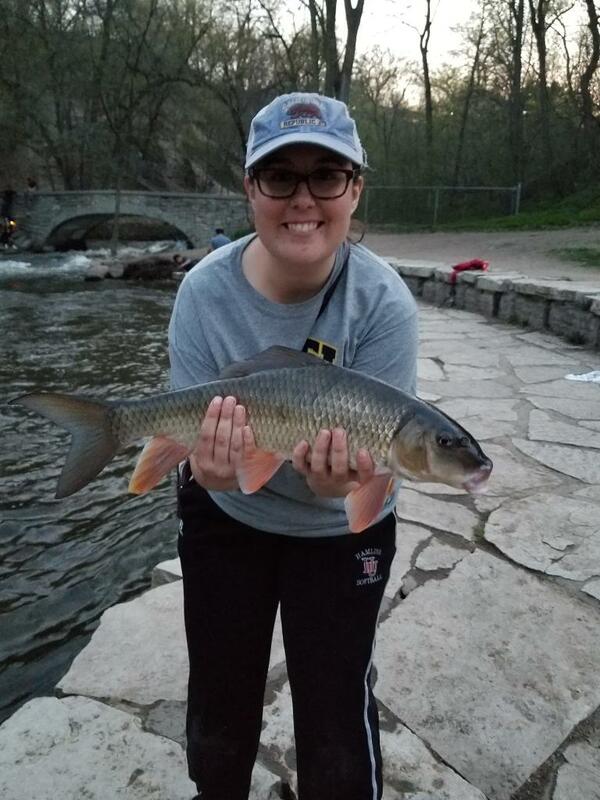 After a short wait, she had successfully fought and landed her lifer Silver Redhorse! She's getting a little more comfortable holding the fish, but is still terrified that she will drop and hurt them. 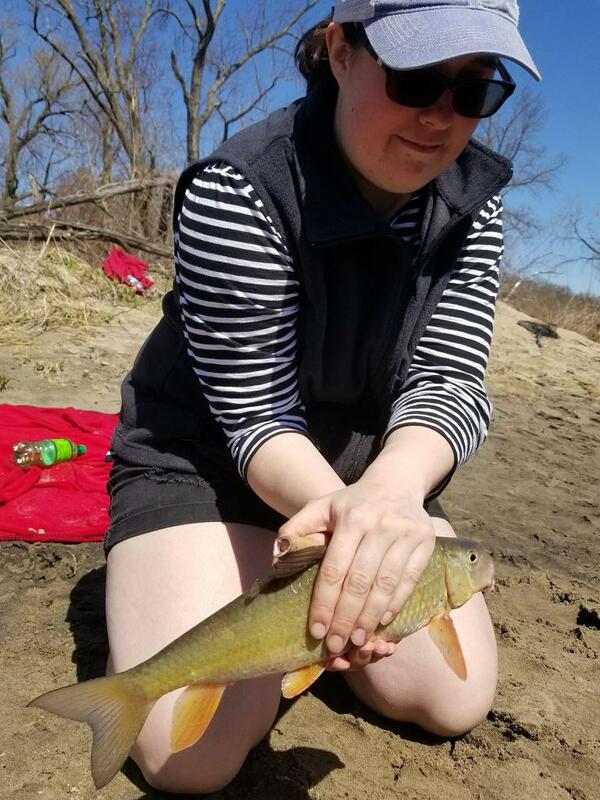 I started casting around closer to a sandbar island, and caught some decently-sized Golden Redhorse and more Silvers while she continued to catch increasingly large Silvers. 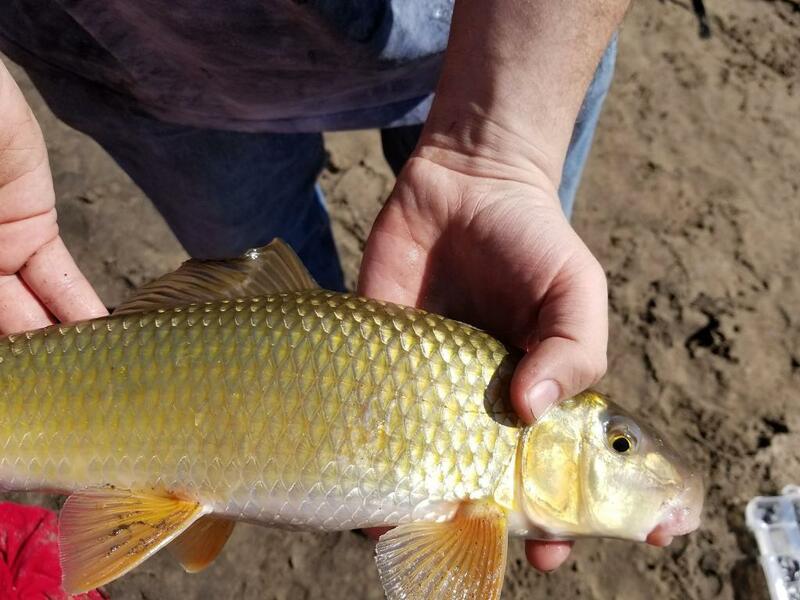 She came over to fish the area I was fishing, and landed her lifer Golden. The action was so fast and furious that we didn't get a chance to eat a single slice of pizza for at least 1.5 hours! 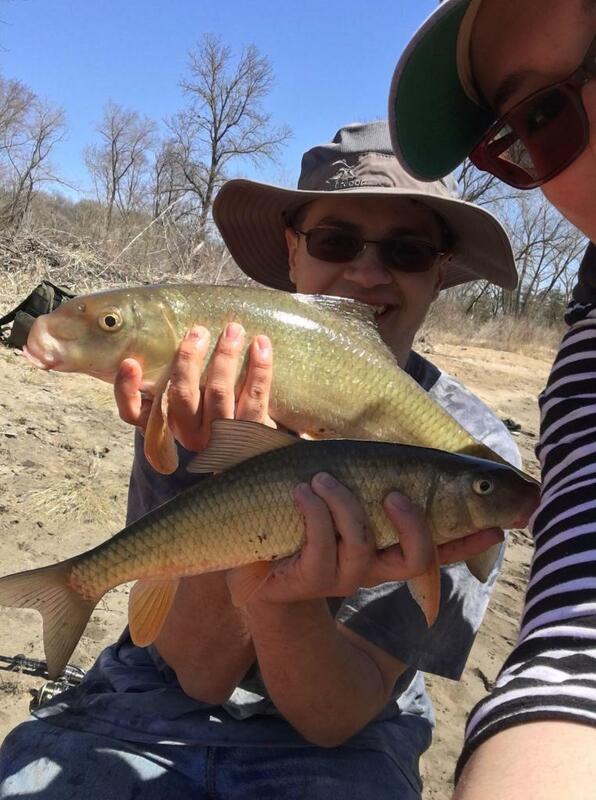 There were two times where we doubled up on fish - funnily enough, both times I got a Golden while she got a Silver, despite Silvers being by far the predominant catch of the day. This is what we have to do when we don't have convenient places to place cameras for self-timed photos. We caught a fair number of large, chunky Silvers that day - here's one of them (admittedly, the camera angle exaggerates its size, but it was still around 24" and thick). We arrived at that spot with a full container of nightcrawlers and half of a container of redworms and left when we were completely out of bait. 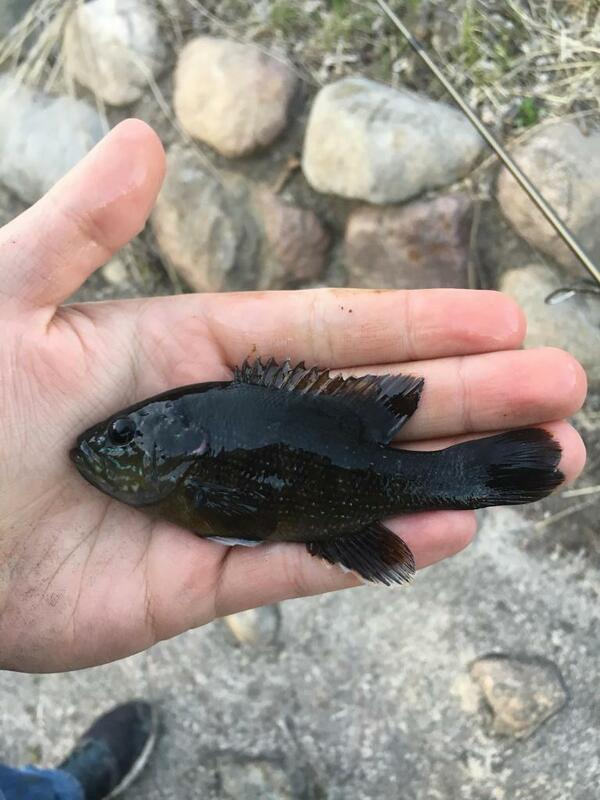 We used half-or-thirds of crawlers and got multiple uses out of many worms, so a conservative guess for the total number of fish we caught in the space of 3 hours puts us at 30-40 between the two of us. I warned her that this kind of fast action wasn't something that happened every day, but we certainly weren't arguing! The action was so consistently hot that we didn't stop to get many pictures. Tired and dirty, we decided to stop and visit Greenwood in his home town on the way home - I knew of a place where we could nab her some sunfish lifers before it got completely dark. 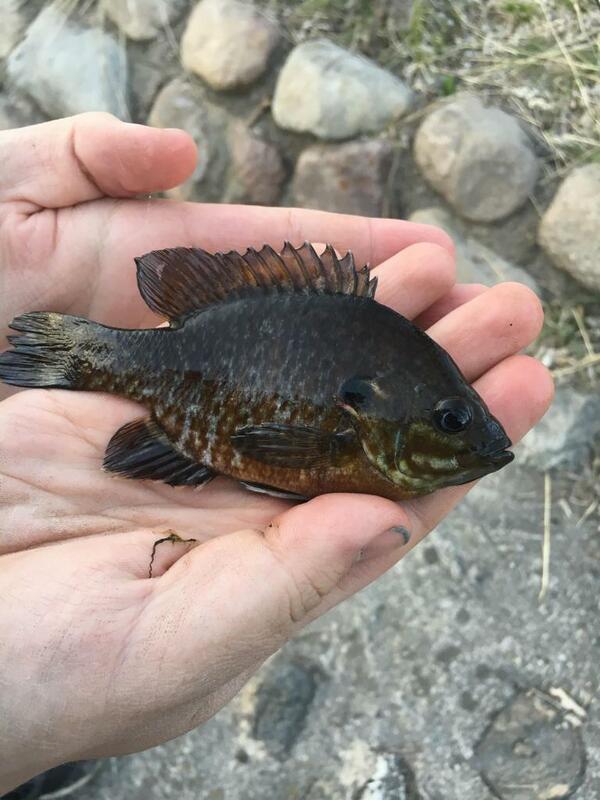 Sure enough, she quickly caught the three predominant Minnesotan panfish, and had a blast while doing it. 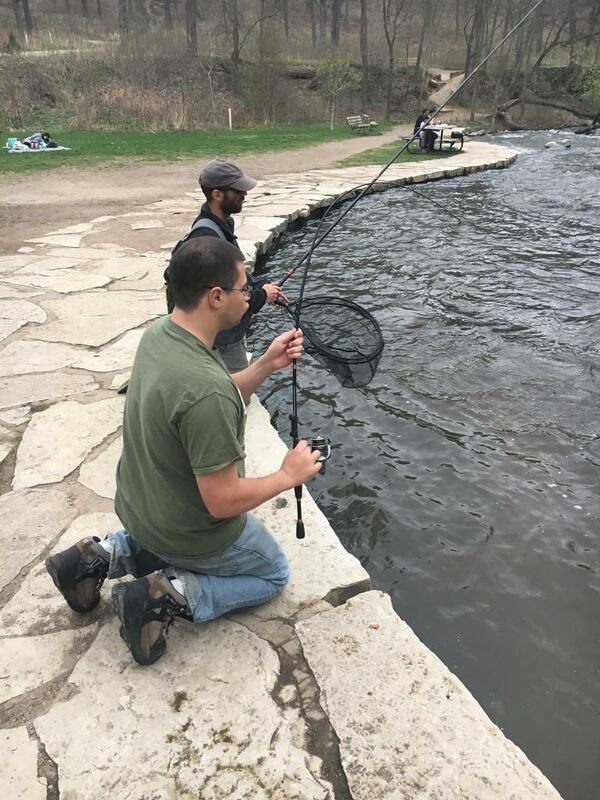 We fished the Northfield dam with Greenwood, where he caught a White Sucker and Dani broke one off as we tried to lift it onto the pavement (sorry!). Overall, this was a truly excellent second outing, and I had a lot of fun introducing her to the best that roughfishing has to offer. 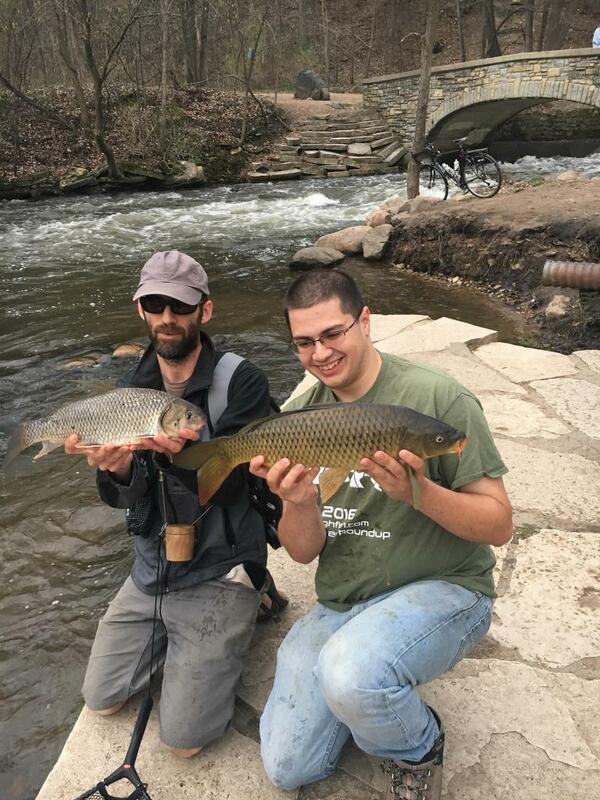 We heard rumors of spawning redhorse and suckers (and quillback, which I need, coughcough) in a well-known spot, and decided to investigate it on the following Thursday. When we arrived, TonyS was already there catching fish like the fishy machine he is. It didn't take long for he and I to hook up with a double. For some reason, I caught a lot of carp that night, while he didn't catch any; instead, he pulled up a freaking Quillback (he is the Quillback Whisperer, after all). Dani hooked up with something that looked a lot like a white sucker, but it wrapped her around a rock and snapped off near shore (again!). But hey, at least we got an obligatory Millenial-style picture with the sunset! And yes. 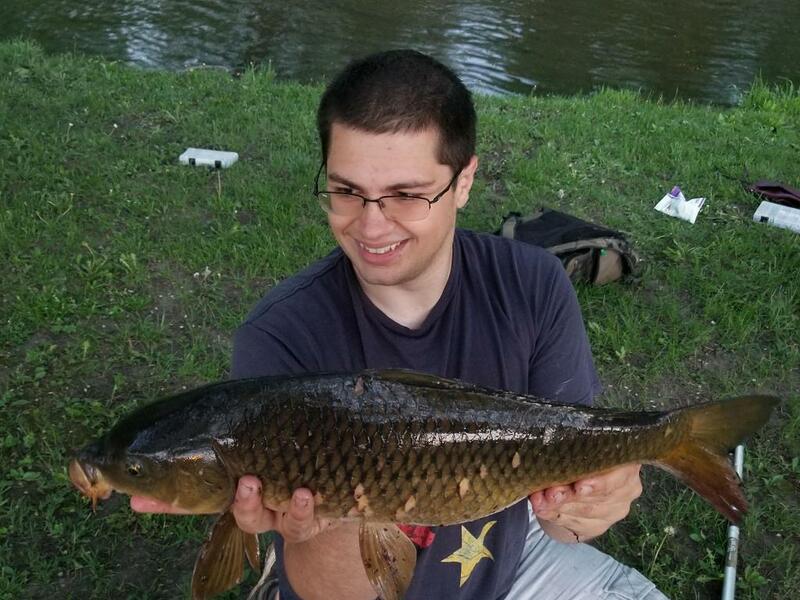 That is a fishing rod in the picture. 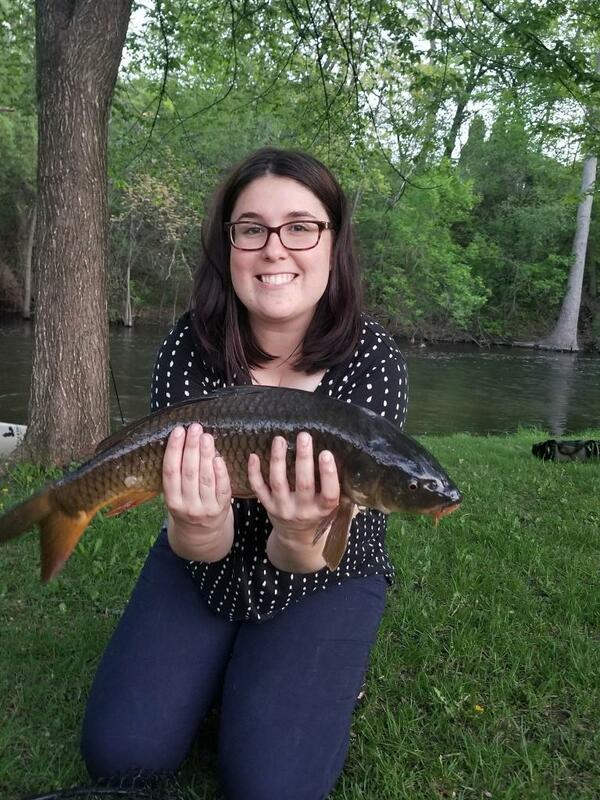 Notice how she's starting to become more comfortable with holding fish! 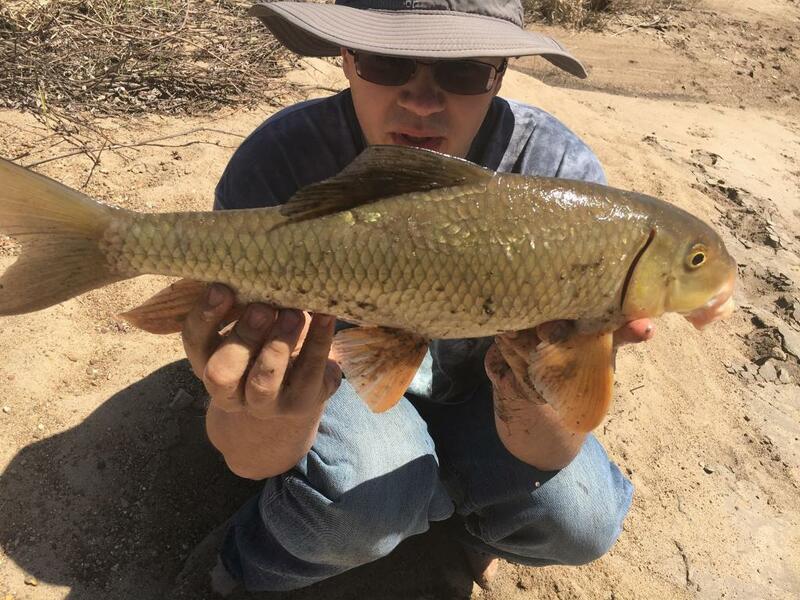 I also got in on the Shorthead action - this river grows them big. 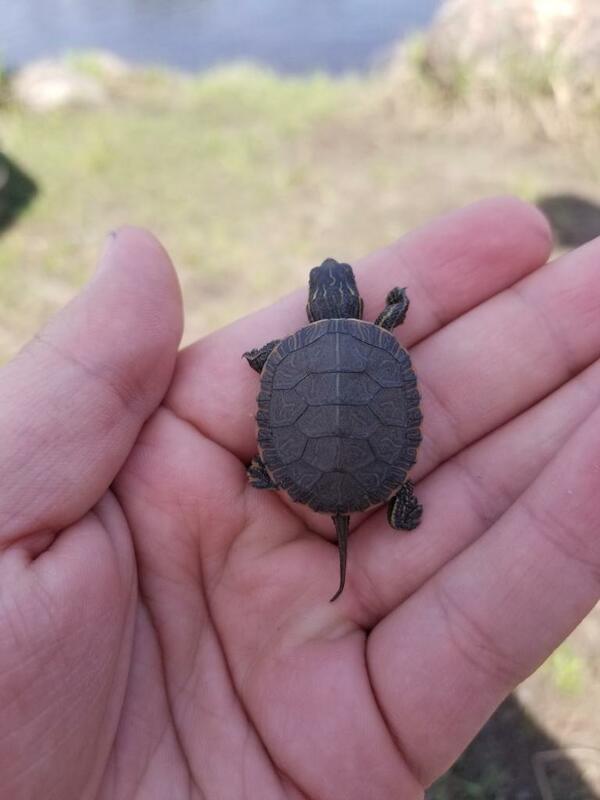 She also spotted an adorable visitor - a freshly-hatched Painted Turtle! The main spot cleared up shortly, and we were able to begin fishing it. Almost immediately, I hooked up with a Silver, and Dani followed almost immediately with one of her own. 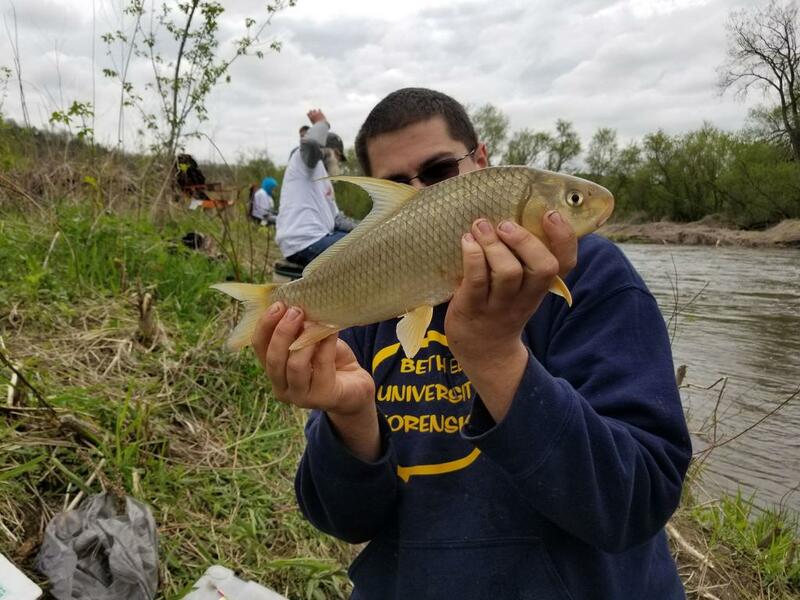 We caught Silvers almost nonstop for around an hour and a half, and we enjoyed educating the spectators (especially the children) about the species. 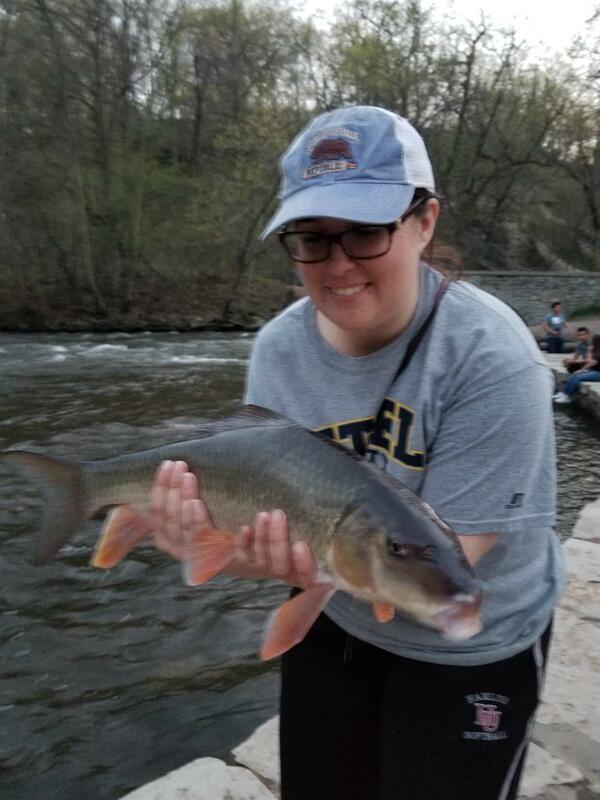 It was a really neat experience marrying my love of fishing with her love of education, and we had a blast. 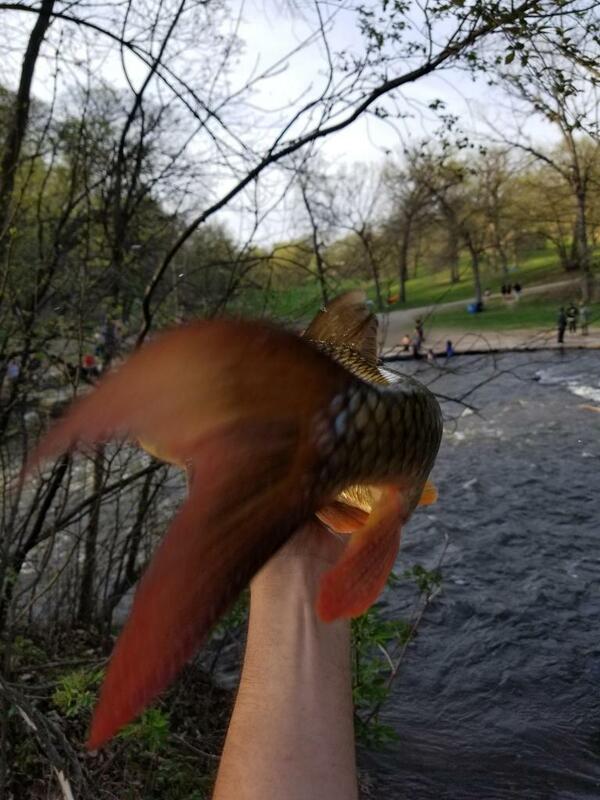 I've never had a blast fishing for an audience before - the less people the better, usually. One of my friends saw my post on Instagram about this and commented that she looks like she's having more fun than me - I look too serious. 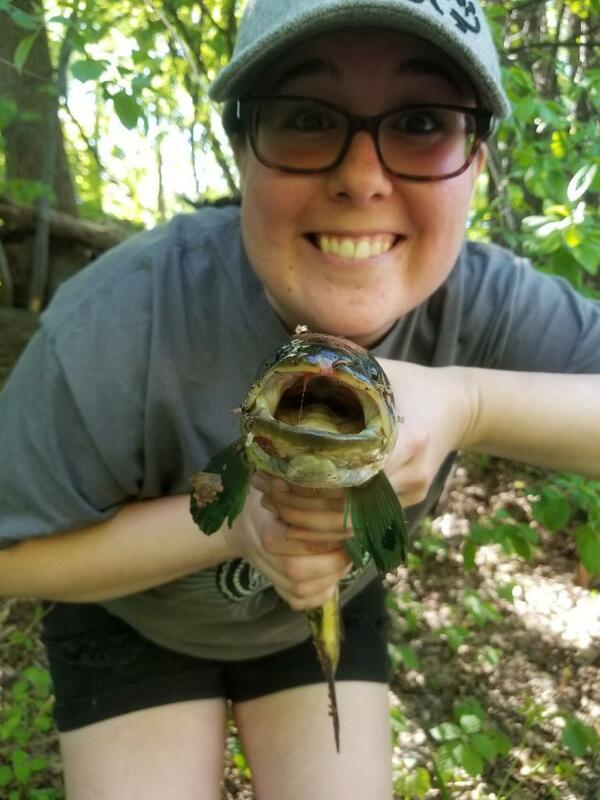 I smile every time I look at these pictures, because I can tell how excited she is about the fish (and how comfortable she is becoming holding them) and how much she truly enjoys the activity. At some point during the night, Dani turned the outing into a competition: Who could catch the most fish? 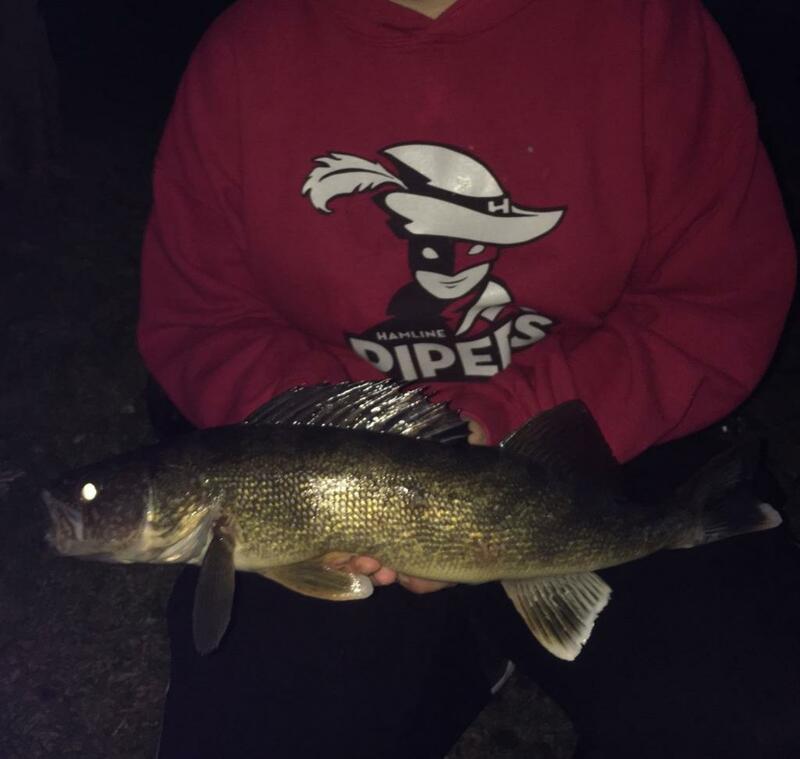 I pulled to an early lead, and we spent most of the night trading 1-for-1 because the bite was so hot, but I hit a slow patch in the last 45 minutes and she located a pocket of feeding fish and caught up with me! This woman is a natural, I tell you. She proposed a Sudden Death round - lines in the water at the same time, first one to catch a fish and land it wins. I agreed, and feared for my fishing pride. Thankfully, one last tank of a Silver saved me - this time. 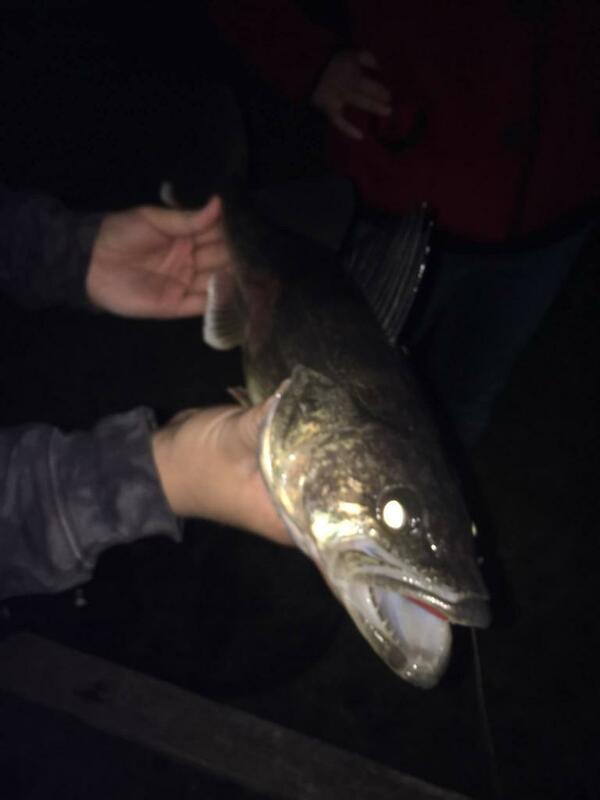 Dani kept fishing as it got dark, and caught a bruiser of a last fish to tie for the day. 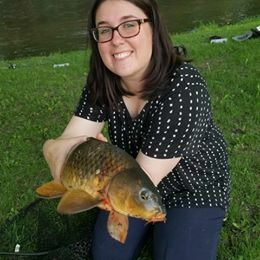 Our fishing blitz was stopped by the Roundup, which she could not attend. I added two lifers and had an amazing time despite spending 50% of the time hiding under a tarp with Moose and Co.
Of course, the weather was pretty much perfect back in the Cities the following week. 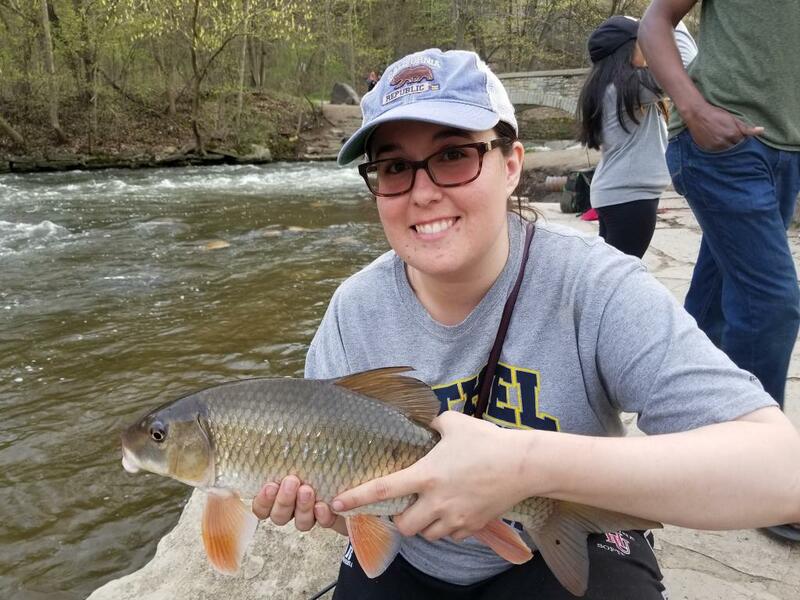 Dani and I headed out to get her a carp on Friday, and succeeded (but only after her lifer slipped through her hands and into the water while I was trying to take a picture - I'm noticing a disturbing trend!). I have no idea why these pictures are so much smaller - they are from the same camera. Oh well. The blood is from the carp's lips and it rolling around in it in the net - they are really uncooperative. They're really hard to hold. 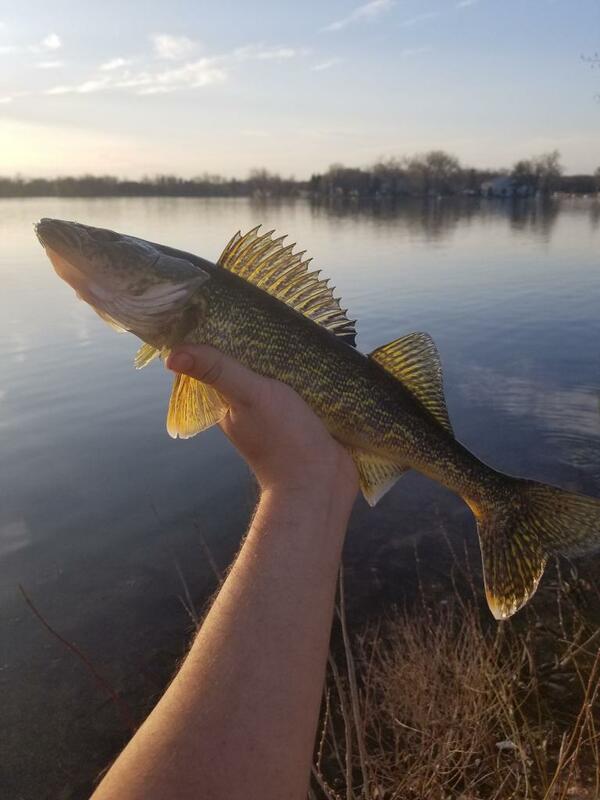 Saturday was supposed to be cold and gloomy, but we made it out fishing anyways. I caught a dink of a Smallmouth, but it was mostly just COLD. Dani never complained; I think we're going to make a great fishing pair. 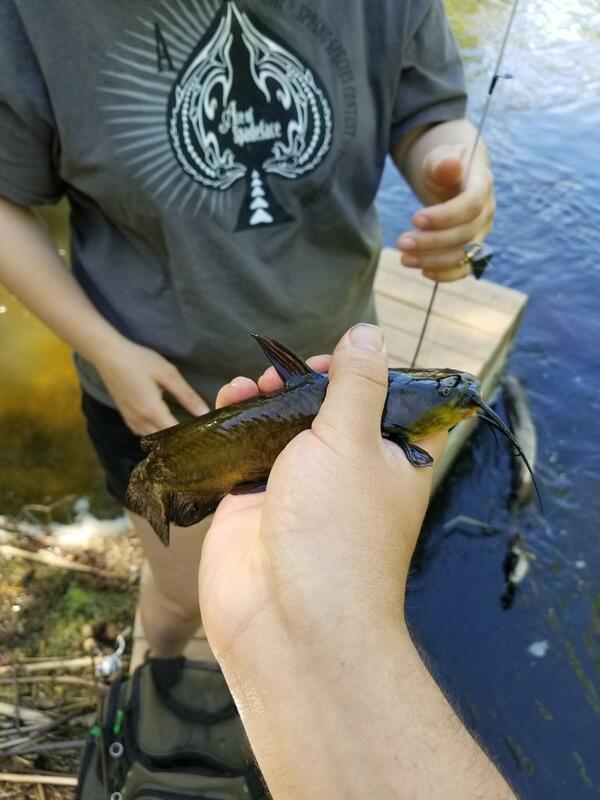 Bullheads are scary to hold. 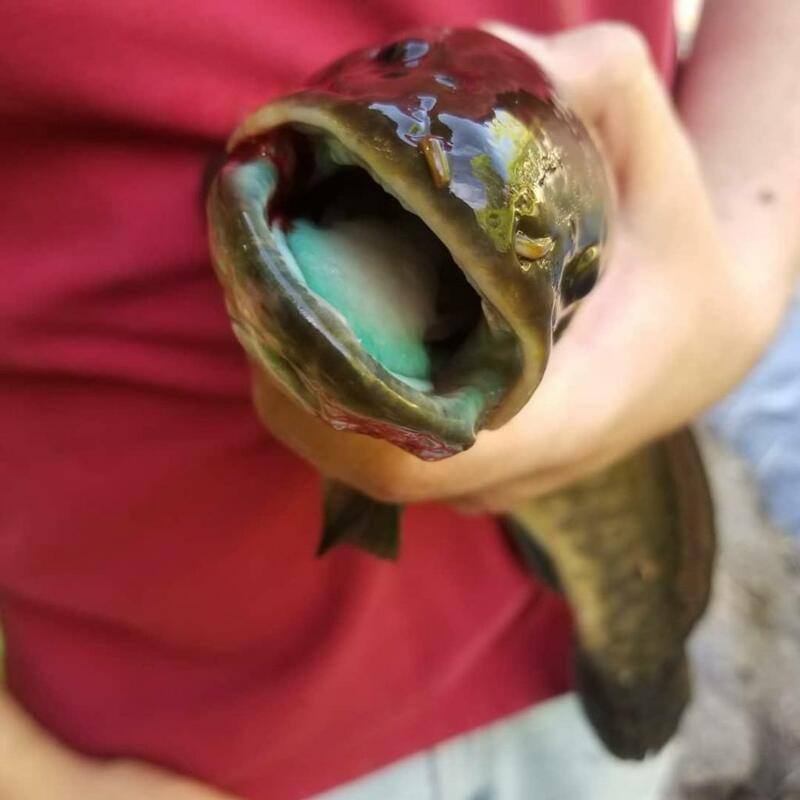 It's not a bowfin picture if there isn't a ton of leaves and/or dirt on it - they're so hard to handle! 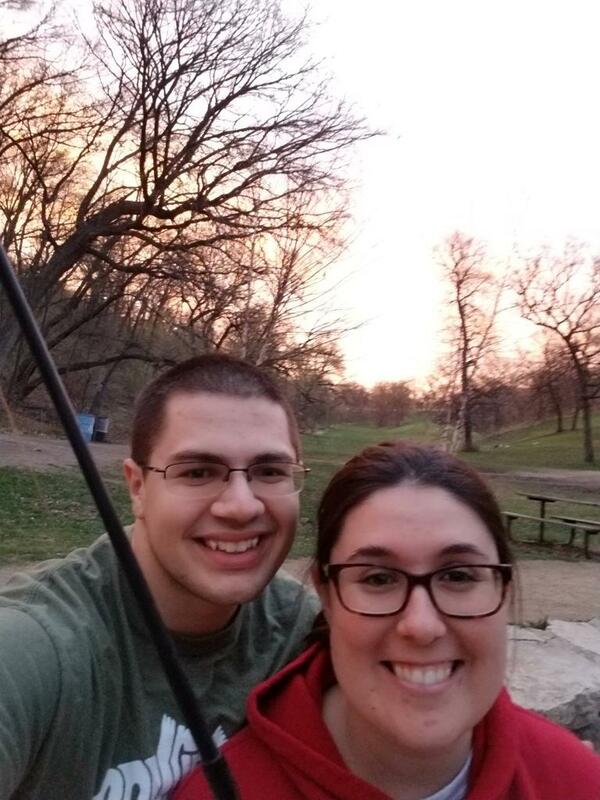 Coming home from work yesterday, I was tired and wanted to get home to sleep, but Dani insisted that we fish for the remaining 45 minutes of daylight; she wouldn't take no for an answer! What have I created??? We didn't catch anything, but we did get to watch a couple of big Musky spawning below the dam, which is always cool to see. 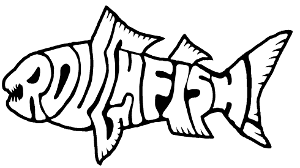 Here's to tight lines, spawning fish, and new fisherwomen! Love the photos! 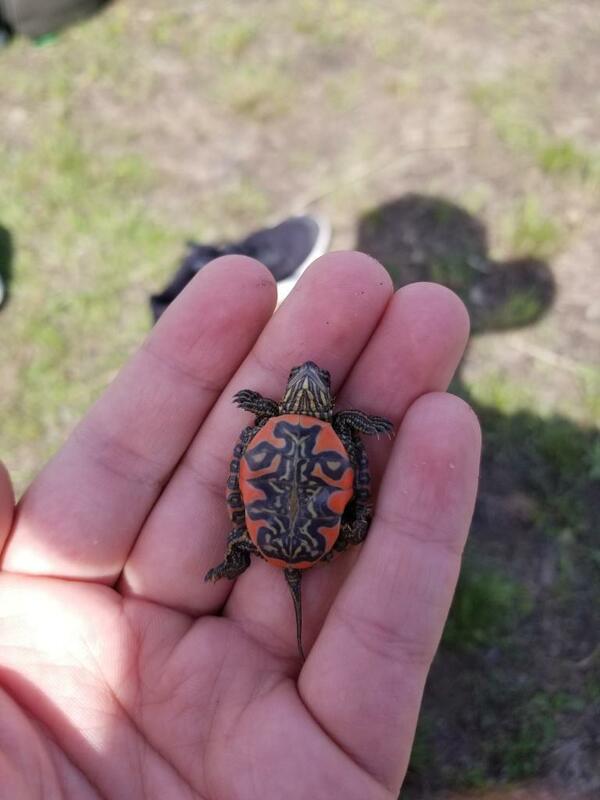 I might run into you guys down on the creek sometime. Awesome catches and photos Graceclaw, and congrats on meeting Dani who sure seems to be a Roughfishing natural!